15mm.co.uk will be releasing a whole range of unique 15mm fantasy figures inspired by and from Japanese myth and anime influence on the 15th May 2014. You can find the page for the range on our website at Sengoku Fantasy. Sculpted by John Bell and initially shown as 'greens' on The Miniatures Page the now titled set of miniatures is being released as Sengoku 15mm Japanese Fantasy. The miniatures will be sold as singles and also in packs at a small saving and lastly as a whole set too. These miniatures will allow you to field a force of mythical Japanese creatures and others suitable for any game system. 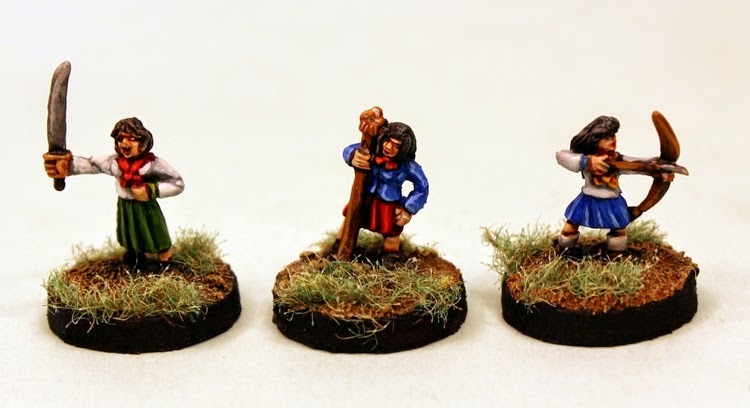 The range includes Tengu Birdmen, Oni Ogres, Goblins and Kappa Turtlemen as well as Anime style female School Girls. If you would like to be added to our mailing list to be notified at the time of release email us on sales(at)15mm.co.uk and title your email 'Sengoku'.